When I opened Stan’s Tech Garage, my first goal was to be able to offer outstanding computer service and repair to the local communities of West Hollywood, Beverly Hills, Greater Los Angeles, and beyond. But I had an ulterior motive: I really wanted to be able to bring my dog Reese, to work. Why was this so important? 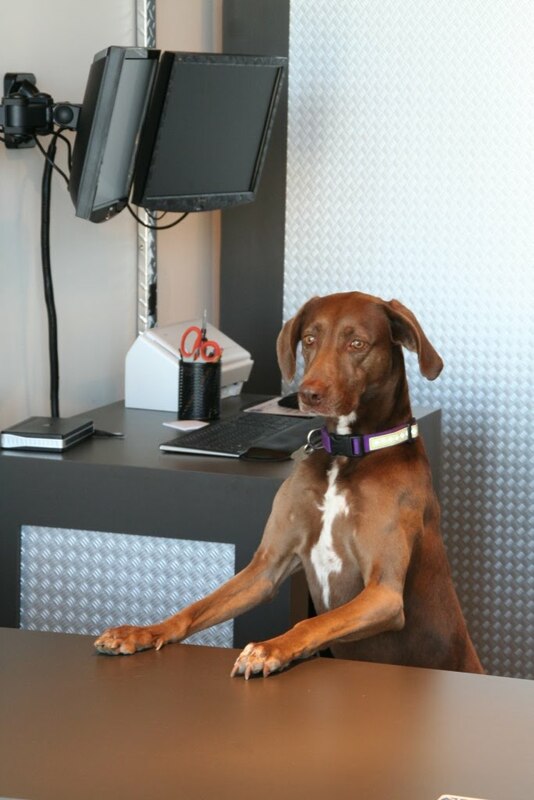 Reese doesn’t know much about servicing Macs or PCs, virus removal, or data recovery, but she’s working on it! What she does bring with her is an instant morale boost in these early dog-days of the business. She also happens to be the best welcoming committee we could ask for. And all it costs us are treats and attention. Even in these trying times, that's a bargain at twice the price. Oh, and she loves other dogs, so if you’re coming by our shop, feel free to bring yours. That’s our Reesie in a nutshell. She insists on greeting everyone who comes in, so don’t be shy. She may let out a bark now and then, but that’s just her way of saying “Welcome!” Bring a treat and you may just find yourself with a new best friend. So next time you’re shopping for some computer services (or you’re just at the Whole Foods in West Hollywood), Reesie wants you to come on over. Can you really say no to that face?